Because your teeth are so important, it is imperative that you keep every single one intact and preserve them from extraction as much as you can. However, different factors such as tooth decay, gum disease, dental cavities, and even tooth loss due to aging can affect your tooth longevity. Dr. Richard Smith and Dr. Mandava have been helping their patients deal with the reality of tooth loss in a much more proactive way by suggesting the use of dental crowns to restore teeth that have fallen victim to cavities or tooth decay. Dental crowns are tooth fabrications that are intended to act like caps that cover the affected tooth. Dental crowns can be used for a number of reasons, including keeping a cracked or chipped tooth together to prevent further damage. They can also effectively restore teeth that have been broken, discolored, misshaped, or worn down severely. Dental crowns have also been found to be useful in providing support for a tooth with a large filling and very little enamel left to protect it. In terms of dental restorations and cosmetic modifications, dental crowns can function as anchors to hold dental bridges in place, or go over a dental implant. Once a tooth is considered for dental crowns, the dentist will prepare it by paring it down to a size that will make it easier for the dental crown to slip over it. There are several different dental crowns to choose from. 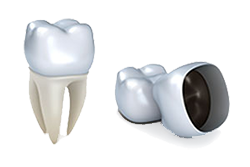 There are stainless steel crowns, porcelain crowns, metal crowns, porcelain crowns fused to metal, all porcelain crowns, and resting crowns. The type of dental crowns that will be used on the patient is greatly dependent on the personal requirement of the patient and recommendation of the dentist conducting the restoration. In any case, getting dental crowns to restore your teeth to a semblance of its original functionality and appearance could prove to be a very good investment towards preserving your smile in the long run. When the patient suffers from missing teeth, they may experience a significant decrease in the strength of their bite, overall oral functionality, and even lower self-confidence that comes from being self-conscious about missing teeth. It is for these reasons, and several others, that it is always a good recommendation to replace missing teeth with some sort of restoration. Dr. Richard Smith and Dr. Mandava have been advising their patients over the years that dental bridges are very useful in their particular field of dentistry because, not only do they replace missing teeth, they also help prevent the atypical migration of adjacent teeth that could ultimately result in a distortion of the structure of the mouth. Dental bridges are composed mainly of two parts—the abutments and the pontics. The abutments are the fabrications on either side of the dental bridge, and are essentially dental crowns, that serve to anchor the whole structure by attaching on to the patient’s existing teeth on either side of the gap. In between the abutments is the actual dental bridge called the pontics, which are composed of fabricated teeth that are positioned right next to each other, filling in the empty space created by the missing teeth. Dental bridges are useful in restoring a person’s ability to chew, talk, or bite normally by effectively redistributing the force created by a person’s bite that may have dispersed unevenly when the person lost his teeth. They also maintain the shape of the face by preventing loss of facial muscle tone caused by missing teeth. In addition to all of this, and probably the most important of all, is that dental bridges prevent teeth from drifting out of position when the ones opposite it are removed. The installation of dental bridges may take several sessions to complete. During the first session, the teeth where the abutments are supposed to attach onto will be pared down to size and measured for their respective crowns. A mold of the patient’s mouth will then be made in order to make sure that the fabricated bridge is accurately tailored to the planes of the patient’s mouth. 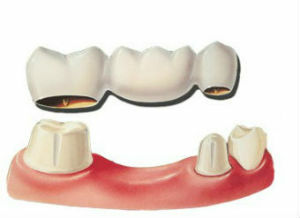 The resulting final bridge will then be adjusted according to the patient’s bite and proper positioning. Once everything is as intended, the dental bridges and may be fixed permanently or again depending on the patient’s personal preference.